FILIGRIS WORKS is pleased to announce even more advancement in the doc-generation technology. 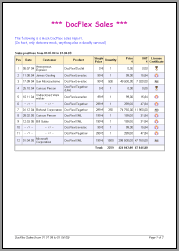 Now, DocFlex product family is extended by a new tool -- DocFlex/XML 1.0 -- a template-driven documentation/report generator by the data obtained from XML files. DocFlex/XML is the most advanced application of DocFlex Technology developed on top of the experience accumulated from the previous two: DocFlex/Javadoc and DocFlex/Together. This tool allows you to visually design the automatic generation of professional quality reports and documentation by the data obtained from your XML files. Such a generation works by interpreting special templates, which are created using a graphic Template Designer. The templates functionally behave similar to full-blown scripting-language programs (such as XSLT scripts). However, the advantage of the approach offered by DocFlex Technology is that it requires very few coding of anything manually and allows to design your templates in the WYSIWYG form. The templates are designed basing on the information obtained from DTD or XML Schema files mostly by using mouse and specifying properties in Template Designer dialogs. The data type information (i.e. XML elements and attributes) appears in various treeviews which are used to program the data processing in the templates. The formatting of the generated documents is programmed by specifying formatting properties of template components (some of which can be changed simply by dragging mouse in the designer pane). Many of such properties are graphically visualized by the Template Designer. The output generator can be both launched from the command line and invoked directly from the Template Designer's main menu which allows you to immediately see the result produced by your templates yet during designing them. The templates are designed basing on the data type information obtained from DTD or XSD (XML Schema) files. The ability to generate reports/documentation by the data obtained from XML files. A single report may contain data from multiple XML files with different structure. Full support for XML namespaces. Sophisticated capabilities for data querying and sorting based on an extension of XPath. The ability to call templates from one another. The elaborated support of template parameters. Both features enable you to reuse the same templates for different tasks as well as organize template libraries, which may help you to shorten the project development time and simplify its further updates and maintenance. The freeware template interpreter and output generator (together with the run-time Java library) available for free use and redistribution both separately and as part of your applications. DocFlex/XML (version 1.0) requires JavaTM 2 Version 1.4.x installed on your system. To parse XML files, DTDs and XML Schemas, DocFlex/XML uses Apache Xerces2 Java Parser version 2.6.2. The freeware edition, which is called “DocFlex/XML Generator”, includes only the template interpreter (output generator) without the Template Designer. Currently, it also includes a set of "XML Documentor" templates (see Sample 1), which allow you to compiles any number of your XML files of any possible types into a nice looking printable (RTF) or framed (HTML) documentation. The templates are embedded as resources into the Java library file. So you can immediately start using it as an utility for documenting your raw XML files. In the same way, we are planning eventually to enrich the freeware edition with some other sets of "heavyweight" templates dedicated to various big XML applications (the next are coming the "XML Schema Documentor" templates). See also DocFlex/XML Roadmap. As a freeware documentation generator for several standard XML applications (using built-in templates). As a command line interpreter for your custom templates (however, only those created with the licensed full version). As a Java library, which will allow you to call processing of your custom templates directly from your Java code. DocFlex/XML is a strategic product of Filigris Works. With this new tool, we are hoping eventually to reach a much wider audience of software developers and break people free truly to start using DocFlex Technology. Currently, the product core is nearly complete. The finishing step will be publishing of DocFlex Open API which is going to appear in DocFlex/XML version 1.1 planned for release in a couple of weeks. The "XML Schema Documentor" templates, which will allow to generate a high quality documentation for XML Schemas. The templates for XMI data sources, which together with DocFlex/XML itself effectively will provide a template-driven doc-generator for virtually any UML modeling tool. What is coming then, you can imagine for yourself. Just look, for instance, at OASIS XML standards repository. All of this is a potential field for creating template-driven documentation generators based on DocFlex/XML! And we believe, this is coming fairly soon, because designing DocFlex templates is pretty easy, nothing near to the efforts needed to develop an equal quality doc-generator for a particular XML application from the scratch! Once the new application templates for a particular field arrive, those templates will be instantly included in the standard template library provided with DocFlex/XML. By purchasing a license for DocFlex/XML, besides the ability to design your own templates, you will be able to customize all those library templates for your own needs. In effect, once having a license, you will be constantly delivered with an ever growing number of template-driven doc-generators for various big XML applications without paying anything extra for any of them! That is the DocFlex/XML development roadmap. With this map, we invite you to travel the exciting landscape of XML applications together with us! Click here to see a screenshot of the template producing such a report. 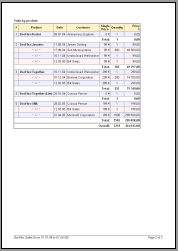 Find out more how this template works by the following link: http://www.filigris.com/products/docflex_xml/samples/sample2.php.